There are plenty of fresh faces in new places as both the OHL Priority Selection and OHL Under-18 Priority Selection are in the books. Here’s a look at what’s happening across the Ontario Hockey League this week. San Jose Sharks prospect Ryan Merkley has joined the San Jose Barracuda to finish-off the 2018-19 season. San Jose’s first round (21st overall) pick last summer, Merkley recorded 71 points (14-57–71) over 63 games between Peterborough and Guelph this past season. The 18-year-old from Mississauga, Ont. was the first overall pick of the 2016 OHL Priority Selection and has recorded 193 points (39-154–193) over 188 career regular season games. Sportsnet’s Sam Cosentino released his 2019 NHL Draft Top-31 Rankings for the month of April this past week, a list that includes OHL names in Arthur Kaliyev (Hamilton Bulldogs), Thomas Harley (Mississauga Steelheads), Ryan Suzuki (Barrie Colts), Philip Tomasino (Niagara IceDogs) and Connor McMichael (London Knights). For the full read visit sportsnet.ca. The Toronto Nationals Midget AAA team is headed back to the Telus Cup for a second straight year. The Nats blanked the North Bay Trappers 4-0 in the Championship Final to advance to the annual National Championship that is set to take place in Thunder Bay, Ont. beginning April 22nd. For full details on the 2019 Telus Cup visit hockeycanada.ca. The 2019 OHL Priority Selection presented by Real Canadian Superstore is complete, but a look ahead at next year’s Priority Selection reveals a strong Toronto Titans Bantam AAA team that recently won an All-Ontario title. The Titans defeated the Toronto Marlboros by a score of 6-1 at the Herbert H. Carnegie Centennial Centre to be declared provincial champions. For a full recap visit OHF.ca. 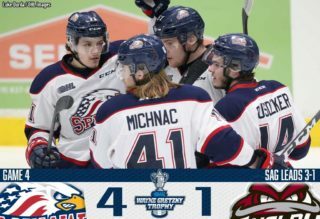 The Detroit Little Caesars reached the semi-final of the 2019 OHL Cup Powered by Under Armour and now they are USA Hockey National Champions, defeating the Oakland Jr. Grizzlies by a score of 4-0 in Plymouth, Mich. For more on the story visit mihockey.com. The 2019 Memorial Cup Presented by Kia host committee is excited to announce that individual tickets are now on sale. Prices range from just $35 to $60 for round-robin games and $50 to $75 for the semi-final and championship final. Tickets will be available at the Ticket Atlantic Box Office, online at TicketAtlantic.com, select Superstore outlets or by phone at 902-451-1221. For full details visit chlmemorialcup.ca. Fulcher makes NHL debut: Hamilton Bulldogs graduate and 2018 OHL champion Kaden Fulcher made his NHL debut with the Detroit Red Wings on Saturday. The 20-year-old from Brigden, Ont. surrendered two goals on 11 shots in a 28-minute relief appearance against the Buffalo Sabres. Fulcher played to a 15-11-2 record with a 3.00 goals-against average and .899 save percentage in 28 games with the ECHL’s Toledo Walleye this past season. He was signed as an undrafted free agent by the Red Wings in October 2017. Fulcher played parts of three OHL seasons between Sarnia and Hamilton from 2015-18, going 57-44-8-5 with a 3.19 goals-against average and .893 save percentage over 115 regular season games. Kane in good company with Blackhawks: London Knights graduate Patrick Kane became just the second player in Chicago Blackhawks history to record over 109 points in a season, joining Denis Savard who accomplished the feat four times over the course of his career. Kane finished the season with a career-high 110 points (44-66–110) over 81 contests. The 30-year-old has played 12 seasons in Chicago, racking up 938 points (356-582–938) over 903 regular season games while also winning three Stanley Cups. He sits fourth in Hawks all-time scoring behind Stan Mikita, Bobby Hull and Denis Savard. Kane was the CHL’s Rookie of the Year in 2007, winning the OHL scoring title in London with 145 points (62-83–145). 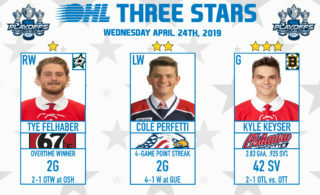 Nedeljkovic, Verhaeghe, Bracco named AHL First Team All-Stars: Three OHL graduates have been named first team AHL All-Stars, finishing their respective seasons with tremendous numbers. 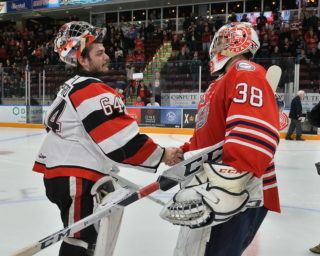 Niagara IceDogs graduate Alex Nedeljkovic played to a 33-9-5 record with the Charlotte Checkers, posting a 2.25 goals-against average and .916 save percentage with four shutouts. 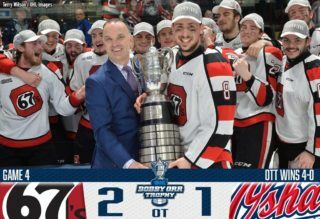 Niagara IceDogs graduate Carter Verhaeghe recorded 77 points (31-46–77) over 73 games with the Syracuse Crunch and Windsor Spitfires alumnus Jeremy Bracco put up 78 points (21-57–78) over 73 games with the Toronto Marlies. For more details on their outstanding seasons visit theahl.com. Houser named ECHL Goaltender of the Year: London Knights graduate and former OHL Goaltender of the Year Michael Houser has been named the ECHL’s top netminder for the 2018-19 season. The Cincinnati Cyclones puckstopper played to a 29-7-5 record with a 2.13 goals-against average, .922 save percentage and two shutouts. Under an AHL contract with Rochester, Houser has appeared in 184 career ECHL games between Cincinnati, Fort Wayne and Manchester. The native of Youngstown, Ohio backstopped the Knights to an OHL Championship in 2012. Mistele named Ryerson Male Athlete of the Year: Sarnia Sting graduate Matt Mistele has been named Ryerson University’s Male Athlete of the Year. Mistele earned OUA West Division MVP honours this past season and was also a U SPORTS All-Canadian, racking up 20 goals, 30 assists and 50 points over 28 games. The former sixth round pick of the Los Angeles Kings in 2014 and 2015 Memorial Cup champion wrapped up his third season at Ryerson. OHL well represented at Acadia Men’s Hockey awards night: The Acadia Axemen Men’s Hockey Team featured five OHL graduates winning 2018-19 season awards including Playoff MVP Cristiano DiGiacinto (Windsor Spitfires), Rookie of the Year Garrett McFadden (Guelph Storm), Defenceman of the Year (Liam Maaskant), MVP and Top Scorer Stephen Harper (Niagara IceDogs) and Most Improved Player Johnny Corneil (Niagara IceDogs).